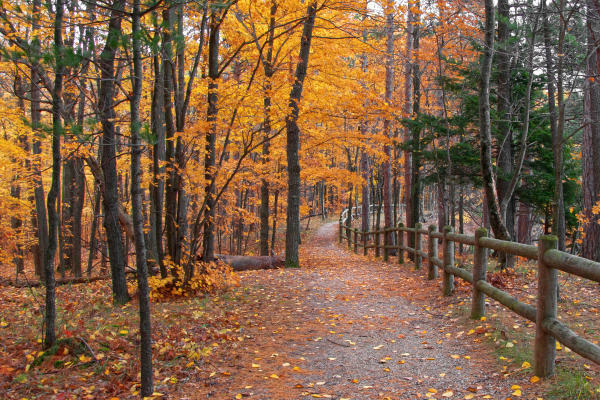 While the autumn leaves are still shining, grab your camera and head to the quiet corner of Northern Michigan known to locals as the High Rollaway. 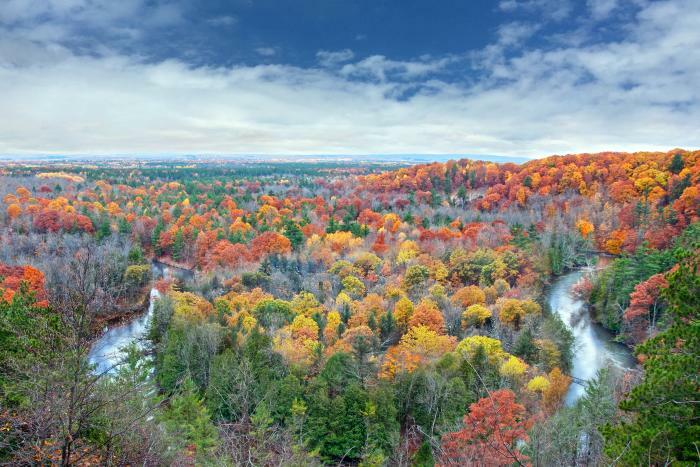 Officially named the Manistee River High Banks Rollaway, your visit to this scenic overlook touches on only a tiny portion of the legendary 4,000-mile North Country National Trail system which winds through seven states. 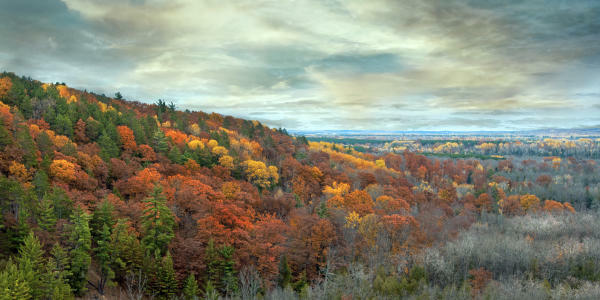 Follow the short, easy trail along the bluff from the parking area to the observation platform perched 200 feet above the floor of the Manistee River Valley. From there, shining glimpses of the river can be seen as it flows in a horseshoe loop through a sweeping landscape of hardwood trees and dense pine groves. It is a lovely spot to take family photos, enjoy a picnic and walk along the well-maintained trails. The high river bluff is the reason for the area’s unusual name. At the turn of the last century, lumbermen needed inexpensive ways to transport timber from the forest to the sawmills and wide-flowing rivers like the Manistee were the answer. Steep banks were used to “rollaway” the logs in a thunderous avalanche to the water where they floated to the mills. Unfortunately, the practice quickly stripped the vegetation from the river banks and, by the time the lumbermen moved on, eroding sand was clogging and narrowing the rivers. In the last 20 years, efforts have been made to stabilize the Manistee River High Banks with fieldstone terraces and replantings. The observation platform was installed in 2001 so visitors could enjoy the stunning view without damaging the fragile system. The trip to the High Rollaway can feel like a bit of an adventure itself as you go from pavement, to gravel, to dirt but it can be accessed by car. From Traverse City, drive south on M-37 to the small town of Buckley. Turn left (east) at the flashing light to N17 (first stop sign). Turn right. At road W4 (next stop sign) turn left. Continue about three and a half miles. Ignoring the sharp curve, continue straight onto a well-traveled dirt road. Park in the parking lot. Born and raised a Hoosier -- Go Boilermakers! -- my husband and I moved to beautiful Traverse City several years ago. Formerly a newspaper editor, I am now a freelance photographer, graphic designer and writer who always welcomes exciting new assignments. Two of my photographs are in the Fort Wayne Museum of Art American Art Initiative Collection. I was also named a 2010 Hoosier Women Artist. More of my work can be seen on my website or follow me on Facebook at Deb Perry Studio for frequent updates.